Ode to Summer is a 3D animation by Ron Hui. The concept was inspired and the execution is amazing. 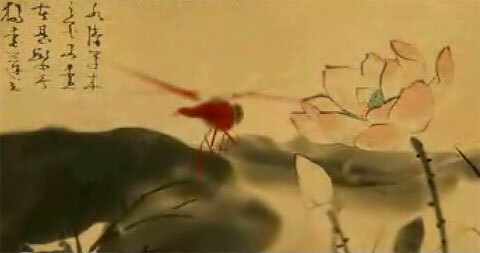 The animation clip starts out with an ordinary Chinese painting… those familiar faded colors on yellowed parchment. Then the camera zooms in and takes you on a 3D tour of “Chinese painting land.” At first it teases you, making you think that it’s just some 3D objects interacting with a rather flat “3D” Chinese environment. But then things get all 3D-rotational and cool. I especially liked the effect of the Chinese calligraphy verses hanging in the air. Check it out. Wow Wow WOW! I’m VERY impressed. Who’s this Ron Hui guy? On this side of the Pacific, there’s not a direct link. Ron Hui (Xu Yi) is a friend of mine! I used to teach him English a few years ago at IDMT in Shenzhen. He was part of the team that worked on Beyond the Mobius Strip, the movie written by Mobius Giraud — I’m not sure if it was ever released, but the animation work I saw at the company looked AMAZING. I’m glad you liked his film so much! Follow the link and look for [VIEW FILM] in red. That was really impressive, especially the parts as you said after the flower comes to life. It’s really great to see this for Chinese content.